I did a lot of work on my xj last year, 35" tires, clayton long arm, and an 8" clayton lift. Just considering other options, I'm also thinking about increasing the backspacing on the wheels, push them out a bit. Any thoughts on this? I know it will put some additional strain on the axles; rear is an f8.8, front is a rebuilt d35 (I know). is this worth trying? looking for people who have actually tried this. Not to be a pic whore for my own rigs, but here are my current XJ and the one I had before that (sold it to go JK during a brief moment of insanity). Both on 35's with 4.5" lifts and 15x10 wheels running 3" of back spacing. 8" of lift is a lot, especially for just 35's. 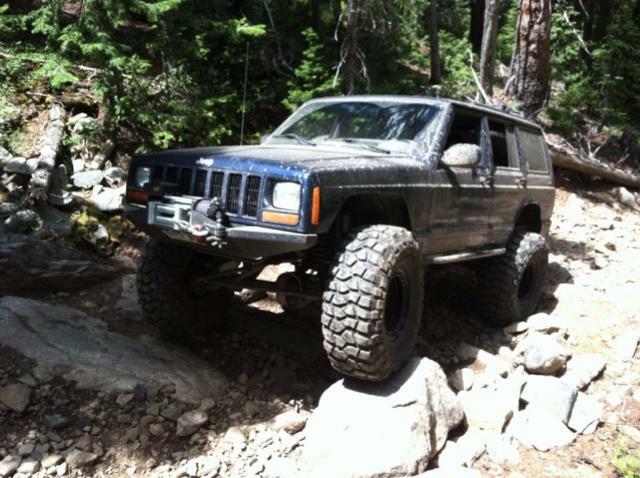 My old 92 XJ was running 6.5" of lift for 37's and was on a slightly wider Waggoneer Dana 40 front axle. I wound up rolling that one, not from the lift height but from a brake line letting go and losing control on an obstacle. When you're talking about crawling its better to have a lower COG and down travel than it is to have up travel. The lower COG helps with stability and the down travel allows the tires to drop out and maintain traction, plus prevent your belly from getting hung up. Granted with more lift comes more belly clearance, but it doesn't do you any good if your rig goes all teeter totter and falls over every time you sneeze. What's your current rim width and backspacing? I know.. I just got through chopping a roof from another truck, having it welded baack on this one, fixing all sorts of mechanical issues from the roll over. after the roll cage, I don't just don't feel like dropping more $$ into lowering it 2", I don't have a feel for how much it's really going to matter. I'm thinking of pushing out the wheels a bit, taking it easy on my next trail run, see how that feels. 2”? You need to drop that thing down 4”. Just ask any girl how big a difference 2” can make. . Seriously though, with stock width axles there is a huge change in stability between 4.5-5” of lift and 8”. Guys running 1 tons and 40’s are barely running that much lift. I know.. putting 8" on was a mistake. I'm being lazy. I just don't feel like scrapping all brand new clayton parts that I just put in. I may try and run with some more backspacing, take it a little easier on the trail, learn the truck. Something will inevitably break this year, when it does I'll drop it down. Are you running a sway bar? I know.. or drop down the truck 2-3", and the difference is marginal. just hate ditching everything for an unknown gain. As an option, you could cut your current coils down and remove a leaf or two. I went up to 6.5 on 35s, didn't like it. Back at 4.5 and its much better. What is your rear setup? Front is just a set of coils, and they really don't cost much. Lower the center of gravity, and trim the fenders as necessary. Buy the necessary parts rather than altering and potentially ruining the parts you have which can be sold. You are talking about some springs and shocks really. Turn around and sell the ones you have, maybe find some used ones to replace them as an interim. White body cheapo shocks will work just fine as you play around with it. That 2000 XJ I pieced the entire lift together from used parts. I found some used front springs, used leaf springs, used shackles, used adjustable control arms (that one was short arm still), and even the 5150 shocks were used. Between CL and the local classifieds on this forum I found everything I needed to lift it up for pretty cheap. Last edited by DutchVDub; February 18th, 2018 at 07:55.